SunMaster Products offers residential, commercial, and industrial sun shade system products, fabric die cutting, and contract sewing services at affordable prices to El Cajon and all of San Diego County. We are experts at custom-designing, crafting, and installing stationary and retractable awnings, canopies, interior and exterior solar screens, blackout shades, drop roll shades, sunroom shades, skylight shades, and patio cover shades. In addition, our full service fabric die cutting and production sewing workshop located onsite at our North San Diego County facility enables us to provide comprehensive production sewing services, and since 1971, we have provided these services for countless numbers of satisfied business and manufacturing clients throughout our service area who depend upon us to finish their contracts promptly, and with an unsurpassed level of workmanship. At SunMaster, we offer our custom shading systems to El Cajon in a limitless array of custom-designed styles, from traditional to modern; a wide selection of fabric types, colors, and densities; and over 100 powdercoat color frame finish options. 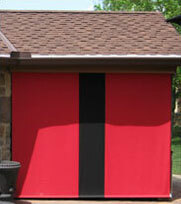 We proudly feature the full line of Sunbrella fabrics, and their over 350 colors and patterns. Sunbrella is an acknowledged leader in the outdoor textile field, and stands behind its long-lasting fabrics with a 10 year warranty – one of the best in the industry. 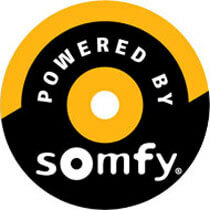 In addition, at SunMaster, we are an authorized Somfy dealer, and our retractable awnings, solar screens, and sunroom and patio shades can be outfitted with either a manual crank or the latest in Somfy motorized automatic control technology. Trust the professionals at SunMaster products for your El Cajon residential, commercial, or industrial sun shading system installation or production sewing project. Call us today. We offer free onsite estimates throughout all of San Diego County and its surrounding areas, and are licensed, bonded, and insured. At SunMaster, we are a family-owned and operated business who can custom-design, craft, and install any style of retractable awning imaginable for your El Cajon home, business, or industrial or institutional facility, in both manual, crank-operated designs as well as designs which feature the latest, state of the art motorized automatic control technology. At SunMaster, we are an authorized Somfy dealer, and can outfit our retractable awnings with their full line of motorized remote control operating systems, timers, wind sensors, and sun sensors. Somfy is an acknowledged leader in the development of innovative retractable awning automation systems, and stands behind their high quality motors and controls with a 5 year warranty. 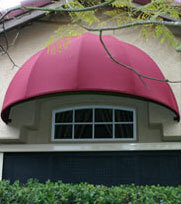 At SunMaster, we are a family-owned and operated business who can custom-design, craft, and install the optimal fixed or retractable awning system for your El Cajon commercial or industrial property's needs – one which will provide your building or grounds with the necessary amount of protection against the elements, while adding a stylish accent to its decor. 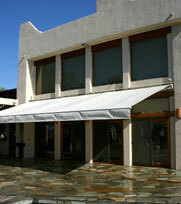 And at SunMaster, we can provide our exceptional quality awnings for a surprisingly affordable price. Call us today. We accept all major credit cards, and are licensed, bonded, and insured. 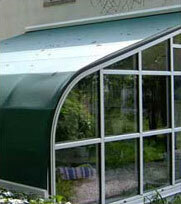 Trust the awning experts. At SunMaster, we can recover, repair, and provide replacement parts for existing fixed and retractable awnings, in order to keep them looking their best as well as functioning at an optimal level for our valued El Cajon clients. We can replace lateral arms on retractable awnings, and can also perform expert retractable awning conversions: transforming manually-operated retractable awnings into motorized retractable awnings by adding a choice of state of the art electronic operating systems. We can also design and fabricate tarps and equipment covers for El Cajon businesses and industrial facilities. Our extremely durable tarps and equipment covers can be sized to fit any type of equipment or machinery, and provide this equipment with a very effective shield against the elements. At SunMaster, our sewing expertise makes us extremely versatile. We specialize in working with industrial type materials, and are experts in making items such as backpacks, handbags, belts, straps, harnesses, and cases for cameras and flashlights. In addition, we are a Mil-Spec compliant contractor, and are often called on by the U.S. military to produce a wide range of items required for military use. We can work with a wide array of fabric types and other materials, including cotton, polyester, nylon, acrylic, lycra, pvc-coated polyester and fiberglass, kevlar, leather, vinyl, webbing, open and closed cell foam, cordura, and plastic. 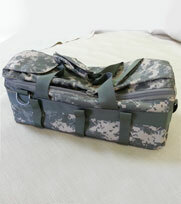 In addition, we also offer expert fabric die cutting services. Call us today in El Cajon. Since 1971, SunMaster has provided countless numbers of satisfied San Diego County residential and commercial clients with beautiful, functional, and affordable retractable patio covers and shades, effectively shielding their families, guests, patrons, and employees from the elements while providing their properties with an attractive architectural accent. At SunMaster, our retractable patio cover shades are available in an extensive selection of fabric colors, types, and densities: both solid and open weave. And in addition to our popular retractable patio cover shades, we can also custom-design, fabricate and install fixed patio cover shades for both wood and aluminum patio covers in El Cajon. At SunMaster, we are committed to providing excellent customer service, and our knowledgeable sun shade system specialists will work closely with you to design the ideal customized shade solution to fit your specific requirements, one which will complement the look of your El Cajon home or business's patio or deck, while providing your outdoor living space with the necessary amount of relief from the elements, for maximum outdoor comfort. While sunrooms and skylights were expressly designed as a means of providing increased natural light in residential and commercial structures, depending upon the season and time of day, this influx of light and heat can sometimes prove excessive. Depend upon the awning specialists at SunMaster to custom-design, hand-craft, and precision-install the ideal exterior sunroom or skylight shade to remedy this issue for your El Cajon home or business. Established in 1971, SunMaster is San Diego County's best value for custom-designed, expertly-fabricated, and precision-installed fixed/stationary awnings and canopies. Our fixed awnings are available in any design we or our valued residential and commercial clients can envision, from traditional to modern, and are offered in an extensive selection of fabric colors and types, as well as over 100 powdercoat color frame finish options. All awning framework is meticulously constructed by licensed welders and installed in strict compliance with all applicable building codes. In addition, our skilled craftsmen can also recover and refurbish existing awnings and canopies, granting them a whole new lifespan and saving our valued El Cajon clients significantly over the cost of complete awning and canopy replacement. At SunMaster, we offer the finest solar screens available, in both interior and exterior designs. We install major brand name lines such as Twitchell Textiline, Phifer Suntex, and Sheerweave solar screens, and offer our exceptional quality sun screen systems with a 10 year warranty. Our open weave fabric, interior-mounted solar screens are very effective at blocking the sun's glare and harmful UV rays, and protecting El Cajon home and business interiors from fading while maintaining a scenic view. And our very durable, open weave fabric exterior mounted solar screens are extremely effective at blocking unwanted heat, preventing up to 97% of the sun's heat from penetrating through the surfaces of your home or commercial building's windows and glass doors, while also preserving the view. Rely upon the experts at SunMaster Products. Call us today from El Cajon to schedule a free onsite estimate. We service all of San Diego County and the surrounding areas, and are licensed, bonded, and insured.